NEWPORT – The rapid loss of sea stars along the US west coast may be caused in part by environmental changes, and not solely by a specific pathogen as many had previously thought. This new hypothesis emerged from a recent symposium on sea star wasting syndrome (SSWS) hosted at Oregon State University’s Hatfield Marine Science Center. Oregon Sea Grant enlisted the Center’s support to bring together 40 top researchers from as far north as Alaska and as far south as Santa Barbara, California. The goal was to clarify the science and develop recommendations for further research, monitoring and possible responses to SSWS. “I think we can all agree that this is one of the biggest epidemics ever in the ocean in terms of range and the number of species,” said Drew Harvell, a researcher from Cornell who is on sabbatical at Friday Harbor Labs in Washington. 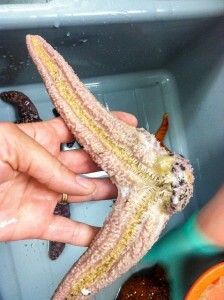 SSWS is the name for a series of symptoms exhibited as a sea star “wastes” away and ultimately dies. Other outbreaks have been observed in the 1970s and 1990s, but despite similar symptoms there are some key differences. The current outbreak—which began in 2013—continued throughout the winter, which has never before been observed, in addition to occurring on a much larger geographic scale. Through the symposium, researchers from different fields—ecologists, pathologists, veterinarians, and more—joined forces to piece together what is known about the disappearing stars. New evidence has failed to show consistent signs of either bacterial or viral infections, leading scientists to question whether a single pathogen is the culprit. In addition, they noticed correlations between warmer average water temperatures and the syndrome’s appearance. “Increases in temperature lead to a cascade of oceanographic changes, ultimately leading to lower pH,” said Bruce Menge, an OSU researcher who studies the intertidal zone. Under this hypothesis, the lower pH would deteriorate the protective outer layers of the sea star. The stars would then struggle to balance their internal concentration of salt and water and would slowly waste away. The increased acidity could also cause calcified bone-like support structures—called ossicles—to erode once exposed. A similar idea is that the warming temperatures and lower pH could stress the animal and weaken its immune system. After that, any number of pathogens could be responsible for causing the animals to waste and die. “It’s possible that sea stars only have a limited suite of ways to show they are stressed,” said Mike Murray, a veterinarian from the Monterey Bay Aquarium. A number of ocean conditions – upwelling, for instance – can cause pockets of warmer or cooler water. This variation could explain why a few areas of the west coast have thus far escaped the outbreaks for the most part. Symposium participants agreed that the exact cause of the outbreak remains a mystery. While environmental drivers are getting new attention, the idea of an infectious disease is still prominent. Harvell and her colleagues are working to identify exactly which pathogen could cause SSWS. All of these potential hypotheses provide testable research questions for future studies. Going forward, attendees are writing group documents to summarize both what is known and what further actions need to be taken to investigate these and other hypotheses. The papers are expected to be completed in August, and to include suggestions for how to best locate and compare existing environmental data, in addition to encouraging more directed monitoring. 1976-79: A devastating SSWS event took out large numbers of sea stars along the west coast. It was believed to be a bacterial event due to the effectiveness of antibiotic treatment. 1983-84: SSWS was found in areas with warmer waters as a result of an intense El Nino event. The outbreak spread to other echinoderms such as sea urchins. Cold winter temperatures halted the spread. 1997-98: Another round of SSWS hit, also spurred by an intense El Nino, but subsided in the winter like previous events. June 2013: The current bout of SSWS was discovered in Olympic National Park in Washington. October/November 2013: Sea stars began dying in large numbers in Monterey, CA. December 2013: SSWS was detected at sites ranging from Alaska to San Diego. Oregon seemed immune at this point for unknown reasons. January 2014: Despite the fact that previous SSWS events subsided during the winter, the current outbreak continued to spread, especially in southern California. April 2014: While SSWS spread widely along the California and Washington coasts, less than 1% of Oregon stars exhibited signs of the disease. May 2014: About halfway through the month, the percentage of stars exhibiting SSWS skyrocketed in Oregon to between 40 and 60 percent of the populations surveyed. June 2014: Researchers convened at the Hatfield Marine Science Center in Newport, OR, to discuss what is known and what should be done about SSWS.